I feel guilty admitting this, but sometimes I want nothing more than to transport myself to the 1980s and indulge in some stereotypical Americanized Chinese food. Chicken chow mein. Beef and broccoli. Crab rangoon. 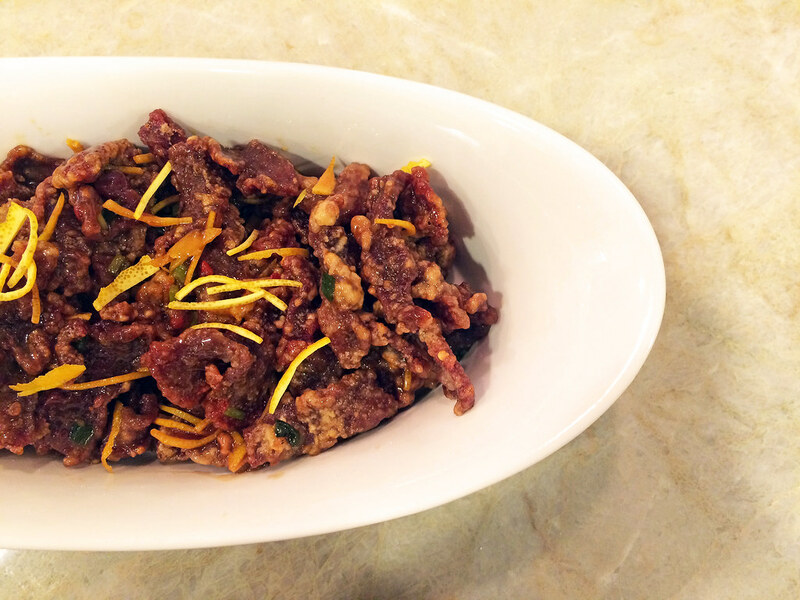 Or maybe this crispy orange beef. Sure, it isn’t healthy or authentic by any stretch of the imagination, but it satisfies that nostalgic craving. And it tastes oh so good. 1. Mix the steak, baking soda, and 5 tablespoons of water in a bowl. Cover and refrigerate for at least 4 hours and up to overnight. 2. Using a vegetable peeler, remove the zest from the orange. Cut the zest into thin strips about 1 inch long and set aside. Save the orange for another use. 3. Make the sauce: mix the sugar, vinegar, rice wine, soy sauce, and 2 teaspoons cornstarch in a small bowl. Set aside. 4. Heat a wok over high heat and add enough vegetable oil to come up about 1 inch. Meanwhile, add the remaining cornstarch and egg white to the steak and mix well to coat the steak with the batter. 5. Add the flank steak to the oil, one piece at a time so it doesn’t splash or stick together. Stir until it begins to look crispy, about 2 minutes. Using a straining spoon, transfer the steak to a colander to drain. 6. Reheat the oil and return the steak to the wok. Fry again until the beef is crispy all over, about 2 minutes. Using a straining spoon, transfer the steak back to the colander to drain. Discard all but 1 tablespoon of oil from the wok. 7. Return the wok to high heat and add the green onions, steak, sugar-vinegar sauce, orange zest, sesame oil, orange liqueur, and chili garlic sauce. Stir-fry until all ingredients are blended, about 1 minute. Serve warm.